Andrew R.: Growing up, my mother would not let my sister and I watch The Simpsons. She says she never did that, but both my sister and I have this memory, and for that reason I never saw an episode of The Simpsons until Fox re-aired the pilot last year. I do not specifically remember her having the same rule with The Ren & Stimpy Show, but I also have no recollection of ever watching Ren & Stimpy. Not that I had never seen an episode, but I do not remember watching regularly like I did with other Nicktoons. And if, in fact, my mom did not allow me to watch Ren & Stimpy, I have to thank her. I did not enjoy this episode, particularly the two cartoons featuring the title characters. Each act seemed to drag on forever, despite being approximately the same length as the acts in Doug, Rugrats, and Rocko that we’ve also discussed. I think it is strange that, of the three original Nicktoons, Ren & Stimpy is the one considered the more “adult.” While Rugrats features babies and Doug focuses on preteens, Ren & Stimpy seems to be the most immature show. Nearly all of the comedy is slapstick and physical, which seems strange for an animated series. One word on the “Log” commercial that was paired with these episodes. This made me laugh more than either of the Ren & Stimpy cartoons. Was this by the same creator and writers? Did these commercials air with every episode? Were the same ones frequently repeated, or was there a new one for every episode? Cameron: “Adult” is not the word for this show, no. “Grotesque” is the correct word. 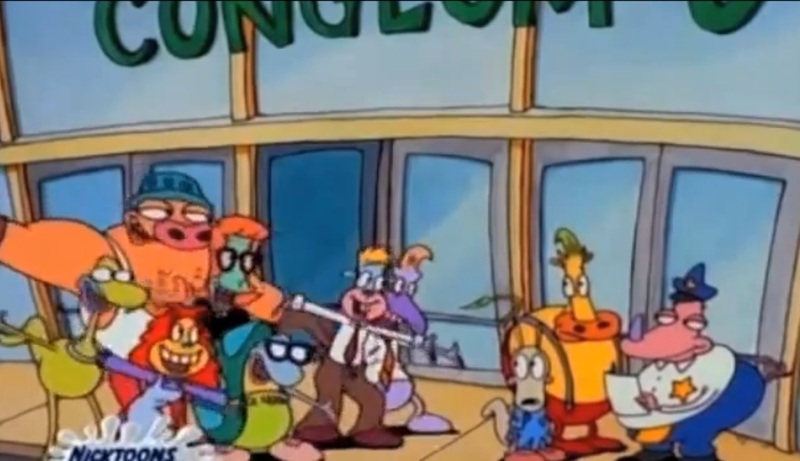 Creator John Kricfalusi was known throughout the ’80s for pushing the envelope when it came to animation, and you have to remember that during this time, cartoons still held the stigma of being for kids only (a stigma that became a double-edged sword when the three Nicktoons premiered and put Nickelodeon on the map). Ren & Stimpy shorts were built on the time-honored classics of sitcom plots, but at every turn, the creative team sought to completely upend viewer expectations about what a “cartoon” was supposed to be. “Haunted House” in particular is very dark and subversive, first by adamantly not allowing the ghost to be scary (as would be expected in an episode set in a haunted house), then following up with a climax that involves the ghost deciding he isn’t meant to live and attempting suicide. 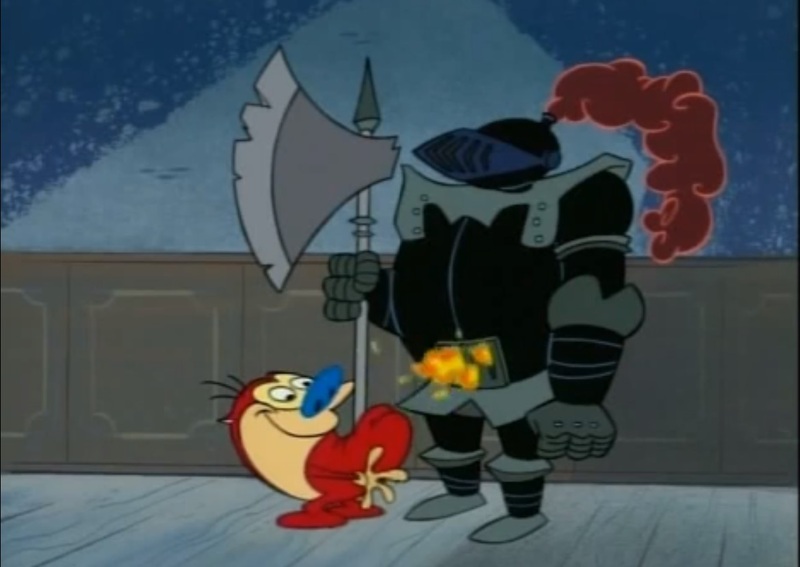 And the show goes one step further: Instead of the protagonists trying to stop him and convince him that life is worth living, Stimpy suggests a better suicide technique than the ghost’s method of hammering a nail into his forehead. Andrew D.: People often associate animation with children. If a TV show or film is animated, many will assume to be either child friendly or less sophisticated than live action works. Shows like Archer or South Park are the exception to the rule, and even South Park was, for its first few seasons, derided as a show paradoxically too risque for children and too scatological and childish for adults. Of course, this discounts the fact that The Simpsons is one of the greatest satires of our age or that just because a work can appeal to children, that doesn’t mean it’s bereft of artistic merit. So if animation isn’t necessarily kids’ stuff, what business does Rocko’s Modern Life have being on a kids’ network? Rocko has no shortage of “immature” humor—it’s barely an exaggeration to say that half of the sound effects were fart noises, even when the characters depicted on-screen aren’t farting. Whether this makes the show “for kids” or not is up for debate. On one hand, many of the jokes play to the most childish aspects of our personalities; on the other hand, many of the jokes will go over kids’ heads. (I still remember not realizing until a few years ago why, halfway through the show’s run, the O-Town chicken shack had its name changed from “Chokey Chicken” to “Chewy Chicken.”) But beyond that, this show screams for an adult audience. Not because it’s immature, but because it’s a very twisted look at adult life. Unlike most other Nicktoons from the early 90s, Rocko’s Modern Life was about adulthood. Just watch the title sequence: Rocko has graduated from college and has entered the “real world.” In these two episodes alone, Rocko deals with trying to be environmentally friendly, protesting irresponsible corporate practices, and poor customer service. These are not exactly issues that most children can relate to. (Okay, maybe poor customer service, but even then, kids would usually get an assist from their parents on that front.) These two episodes also play around with structure, and the conceit of “Fatal Contraption” almost dares kids to change the channel. The episode contains only one line of spoken dialogue, relying on visuals, sound effects, and musical cues to tell the story. Watching the episode now was absolutely delightful, but I remember being frustrated by it as a kid. I remember spending the first half waiting for someone to say something, then watching the remainder feeling dumbfounded as to why Rocko and the rest of O-Town were suddenly mute. But finally, the show is a pretty cynical look at “modern life.” From the way it portrays convenient processed foods (“spreadable pig fat”) to the way it portrays modern corporations (Conglom-o owns everything, even city hall and the citizens of O-Town), the world that Rocko lives in is deeply antagonistic. At times, this translated into downright scary imagery and plotlines (Rocko being turned into a fly as punishment for harming a fly was always very disturbing to me as a kid). Here, we’re taught that if we mistreat our planet, it’s going to mistreat us right back. Granted, it’s an important lesson, but it’s so unlike most other environmental entertainment aimed at kids. But that is part of what helps make this episode not only tolerable, but one of Rocko’s most memorable. The supremely catchy songs help, too. Andrew R.: Andrew, I think it’s fascinating that you brand Rocko’s Modern Life as more for adults, which was a belief of creator Joe Murray as well, particularly in regards to “Zanzibar.” Last month my sister began working for Nick Jr. as an educational researcher for an upcoming show. Unlike the daytime Nick Jr. shows, however, standard Nickelodeon fare need not have any educational value. “Zanzibar,” however, educates at every possible turn, whether intentionally or not. The episode teaches important lessons about the environment and recycling, while throwing in a quick spelling lesson and even a line stressing the importance of cleaning (I may be stretching here). And they do it all in catchy songs! One quick note on Rocko generally. While the series itself has a high place in Nicktoons history, the greatest impact for Nickelodeon may be two people who came to the network through this show. Creative director (and Murray’s replacement when he left the series) Stephen Hillenburg, and voice actor Tom Kenny, who portrays Heffer Wolfe among others, went on to, respectively, create and star in SpongeBob SquarePants, Nickelodeon’s longest-running and highest rated series to date.